Took a rare day off yesterday and travelled, with J, to the Suffolk coast. The first stop was Kessingland, with its striking church. I love the tall tower an partly thatched roof. We visited the grave of J's parents and checked the lettering for her father that was added to the memorial. 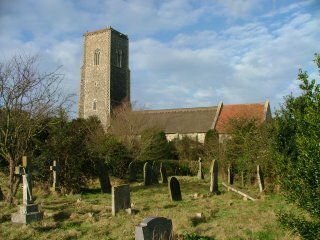 Afterwards, we wandered through the graveyard. Some graves date back to the 1760s and I was interested in the lettering and carved motifs, which ranged from skulls to anchors (for sailors). We ate lunch in a pub overlooking the sea before walking alng the beach. In the afternoon, we dropped in to see Arthur at the Suffolk Villa gallery in nearby Lowestoft. He always has a good selection of East Anglian artists on display. It was good to be in Lowestoft again. J grew up here and we were married in this town, twenty four years ago. Back to work today on another commissioned piece. 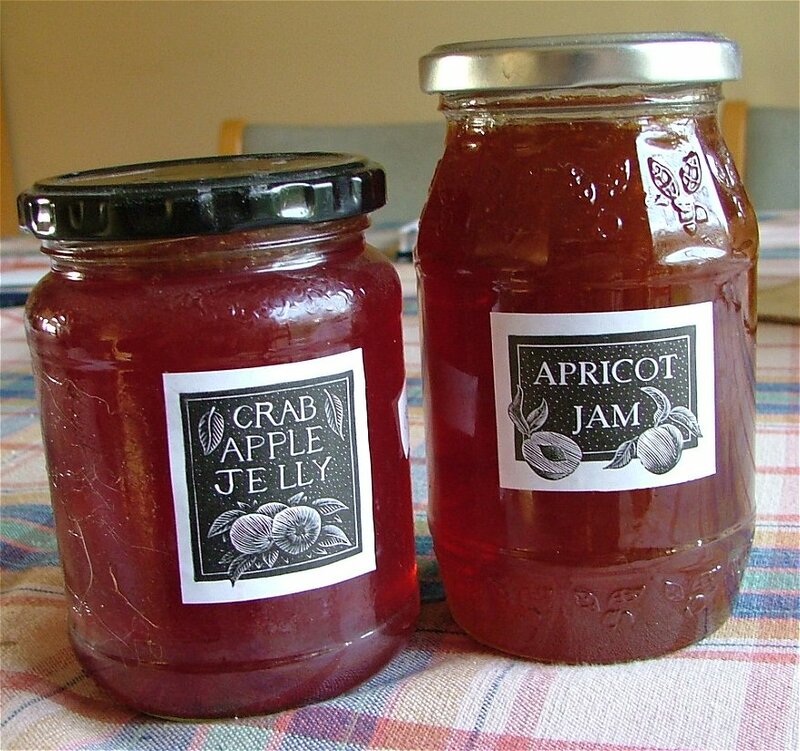 Regular readers will know that I tend not to show these so I will lead you into the kitchen to see what jars of jams and conserves look like in the house of an engraver. A and O are hosting a small party tonight and the music has started. ts time to tidy myself up and slip off, with J, to a nearby house to meet up with some other villagers. I hope that 2007 brings everything that you wish for. So what is the happy engraver doing today? Up early to scrape the ice off the car and run J and A to the station, then help O scrape his car. Took food and water for the hens and walk out with Bella through icy lanes. Into the studio to rig up another temporary handle for the small Albion. I fettled it from a spanner and a yard of black insulating tape. I must get a proper one cast next year. Finally, I set the inking slab warming over the little oil filled radiator ready for printing - the main task for the day. And now? Steaming hot coffee, toast and marmalade - and a chance to blog after yet another hectic week. Today should be one the last big working days before Christmas. 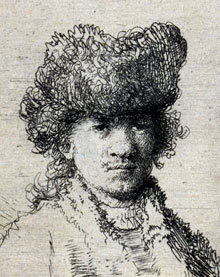 The latest news on the Rembrandt is that is does appear to be the self portrait with a fur hat from 1630. I need to arrange to take it to the museum to compare it side by side with their example. 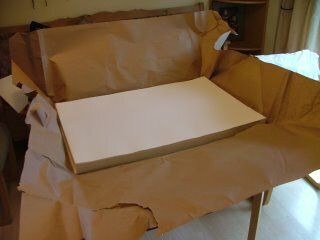 At the moment, its propped up on a shelf; I'm looking forwards to seeing it conserved and framed. Set Off To London - Came Back With A Rembrandt! It seems like I have been engraving solidly for weeks, working through my list of bookplates and other commissions, and so it was with great pleasure that I, together with J, took a day off and went by train to London town. First stop was the British Library - just five minutes walk from Kings Cross station. There is a wonderful display of treasures. J mainly drooled over illuminated manuscripts - as did I, but my heart was finally lost to a Gutenburg Bible and Caxton's Fables of Aesop. A short walk took us to Falkener's Fine Papers. Here were more treasures and, if we had not a day in the city ahead of us, I would have stocked up on hand marbelled and paste papers. A couple of weeks ago, A and I had spent a happy half hour in the Fitzwilliam Museum in Cambridge. 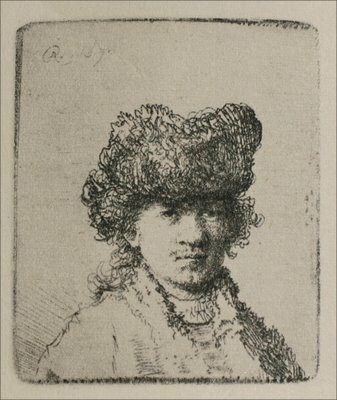 I had wanted to see the exhibition of Rembrant etchings and A was glad to come along and join in the fun. It is a lovely display of etchings in a small room off one of the main galleries. Much of it concentrates of his portrayals of his wife, Saskia, but there are also many of his etched self portraits and we were really captured by them. Now people who know me well will confirm that I am not great at remembering people's names but I maintain that I remember every painting, drawing or print I have ever seen. And that is why, gentle reader, I was in a state of some excitement when I took my own Rembrandt self- portrait, rescued from the box, to the desk and paid for it. My copy is wider and has just the end of the signature/date above the head. I need to get some advice about the state of the etching - it would be great to find out that this is lifetime impression. I also need to think about conservation. I doubt that it has any great value but it is a thing of great beauty. Just to contemplate the quality of the working takes the breath away; it is amazingly fine. And how much did I pay for this? I would normally avoid any financial references here but I have to tell you... sorry, but I really MUST point out that it cost me slightly less than the cappuccino that I enjoyed at the British Library! 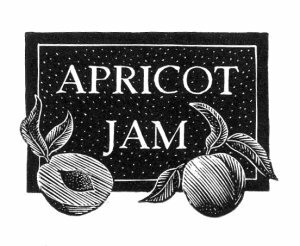 It just goes to show that even an impecunious engraver can acquire art. We enjoyed the rest of our meanderings through London but, I have to confess, my mind did keep wandering back to what I was carrying in my backpack, slipped into a magazine for safety. And now back to work, a chilly studio and the LJ bookplate.